1. As usual, a few pieces of the magic branch have fallen off in rehearsal. It will need to be spruced up. 2. 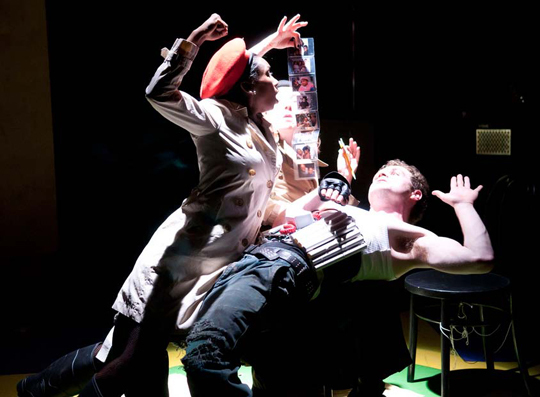 The pill-popping scene will require some edibles onstage. 3. The “meat pie” served in Act I (if eaten) must be vegan. Tofurky might be a good substitute. 4. ADD: a “Sheep” magazine with a centerfold (not seen by audience currently) for Touchstone in Act II, iv. 5. Thanks to Jane for looking at the sandwich. She put some weight in it and it only rolled a little bit tonight. 6. Please ADD a pitchpipe. The Halloween band needs to be able to get their note prior to playing their kazoos! 7. The C4s are falling off of the suicide bomb. Can we re-glue these back on? 8. Please see separate email about shampoo bottle research. 9. Thank you for the new blindfold—we are finding that it is a bit short this year (or perhaps our heads are bigger?) May we please have a longer one? Last year’s length was 49”. 10. Mr. Willis would like to experiment with white rubbery insects this year for Marley rather than black worms. Perhaps white worms or white maggots? We would love to try something for rehearsal. 11. Do we have two pairs of goggles we could use for a whip practice session? 12. We are ADDING: Bubba teeth and six Renaissance swords. 13. We have had a lot of smoking sessions and have decided that we would like to smoke oregano joints as well as oregano in the bongs. 14. ADD: a small blanket, rat puppet, water puppet, alligator. (L to R) Courtney Thomas, Jessica Kitchens, and Alex Crowther don’t appear to concerned with the re-glued “suicide bomb” in the M.F.A. Program class of 2012 production of Archangels Don’t Play Pinball. 1. Joey and Ruth have sofa business that works very well with our smooth leather rehearsal sofa. They slide, scoot, and eventually roll off it. Will the fabric on the real sofa support this type of action? 2. Orlando will be dragged across the floor during the wrestling. Will the floor be sanded and sealed? 3. Would it be possible to get a taller stripper pole? (L to R) Duke Frederick (Brian Clark Jansen) watches on as Charles the wrestler (Richardson Jones) drags Orlando (Max Rosenak) across the floor in the M.F.A. Program class of 2011 production of As You Like It. 1. Ms. Monteleone’s quick change into a St. Bernard is approximately 74 seconds. 2. Solyony and Tusenbach will grow mustaches. 3. We would like Mr. Walden to be in flats or “kitten” heels for II,25 [Ride ‘em Hard] to better match the height of the other hookers. 4. The body cast quick change will be an interesting challenge. 5. Is it possible for Mr. Cusick to gracefully remove his wings during the “Homosexual Convalescent Center” number? 6. Please ADD a sombrero codpiece. 7. Mr. Fusco will remove his overalls for the wedding. 8. The fake beard for Kulygin should look like a German teacher. 9. Thanks for the wings! Kathleen Elizabeth Monteleone has successfully made her 74-second quick change into a St. Bernard in Armistead Maupin’s Tales of the City.